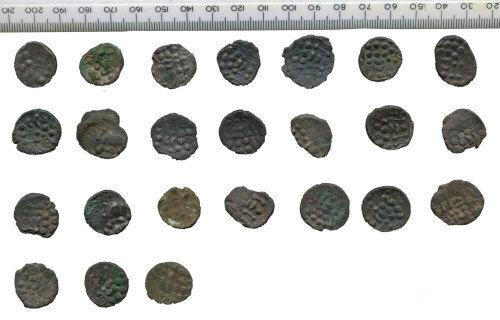 26 base silver staters of the British Iron Age (South Western uninscribed (Durotrigan) type. Two are stuck together (image 9). Cf. ABC 2169 (BMC 2555-2636) although no. 8 may be ABC 2160 (BMC 2662/2690). 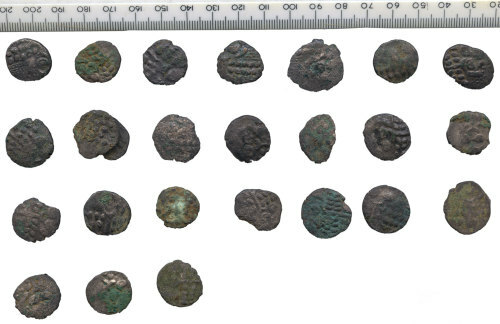 An Iron Age copper alloy stater of the Durotriges. ABC 2169 (Cranborne Chase), VA 1235.1, BMC 2555-2636.